We are delighted to have been awarded silver at the National Company and Supplier Awards this November. 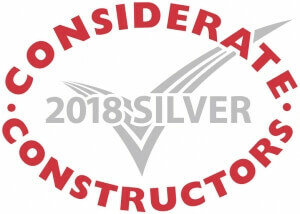 As part of the Considerate Constructors Scheme, the awards are designed to help promote a positive and forward-thinking industry, and only the highest scoring members are chosen to take part. In order to be selected for a silver award, our performance has been judged in accordance with the scheme’s Code of Conduct between the 1st August 2017 and 31st July 2018. We are honoured to have received this prestigious award and would like to congratulate all those who were nominated. It was a pleasure to meet the other nominees at the awards ceremony, which was held at the headquarters of the Royal Institute of British Architects (RIBA). We hope to continue working together to contribute towards a more positive and considerate construction environment.